Since the 1990s, zines have played a crucial role in bringing awareness of feminism to young women. 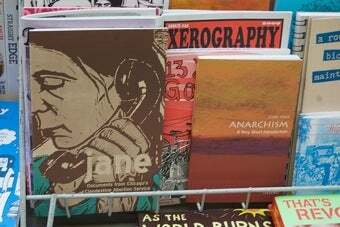 But with the publication of a new book devoted to Zine culture, one has to wonder, are zines obsolete? [Piepmeier] connects them with what she identifies as earlier forms of feminist "participatory media": the scrapbooks kept by suffragettes to document and respond to sexist characterizations of their work; the pamphlets that transmitted contraband information about contraception and sexual health to women in the early 1900s; the mimeographed flyers that called women's libbers to consciousness and revolt. "Participatory media represent a way of engaging with unfriendly mass culture and transforming it — if not always on a broad scale, at least at the level of the local," she notes. It's not just the content of these zines but their form, their look and feel, their "girl style," that make them noteworthy. Early-'90s grrrl zines made liberal use (and fun) of both contemporary and retro sexist images — apron-wearing housewives with vacuums, tattooed pinup girls, bikini models torn angrily from ads, ironically juxtaposed with princess and Hello Kitty cartoons — developing a distinctive visual vocabulary that set them apart from both earlier feminist newspapers and zines about other topics. Piepmeier describes them as "sculptural media," notable for the pleasure that their makers experience in constructing them and for the small thrill the recipient gets in opening up a hand-decorated envelope or finding a tiny, raging, perfect zine in a crammed independent bookstore. But like print media in general, zines have been threatened by the rise of new media. Clark cites feminist blogs including Feministing and the women's writing community She Writes as progenitors of the energetic third-wave feminism found in zines. In a way, there's a certain sense to this: Zines evolved as a way to quickly and easily spread a message. Like blogs, they give anyone an opportunity to be the writer/editor of their own stories. And blogs make it even easier to borrow and steal material, taking images from one source, throwing them casually into another. They also provide the opportunity to reach a much larger, almost unlimited, audience. Both Piepmeier and Clark are quick to point out that they don't believe zines are going away anytime soon. Despite the fact that the muddling and mixing of pop culture, retro reappropriation and punk symbolism has "mutated in the toxic sludge of commercial culture" and become as commercialized as anything else, Clark argues that there is hope for the zine yet. This debate is somewhat reminiscent of the whole Kindle vs. Book crisis that has been popping up in op-eds on and off for the past few years. Yet like books, zines have the something that blogs don't: Presence. Blogs may offer a large audience, but they're still somewhat distancing and intangible. And this may be purely anecdotal, but it seems that the prevailing trend in blogging is a kind of twee girlishness that bares little resemblance to the anger and energy of riot grrrl culture. Perhaps most importantly, blogs provide a certain polish that zines purposefully lack. Both forums may give an outlet for confessional outpourings, but there is a strange intimacy to be found in an object so carefully constructed and stapled, delivered from hand to hand. As much as I love blogs (and Kindles, and iPods) there is something to Piepmeier's argument for the fragility of the real thing. So if you'll excuse me, I have to go buy some glue sticks and glitter.